Roberto Nelson, Junior, Shooting Guard (9.3 PPG, 2.6 RPG) – Plain and simple, Nelson needs to step up this year. The highly touted shooting guard out of Santa Barbara has been fine watching and learning behind Cunningham, but he has no choice but to become the go-to guy when the Beavers need points down the stretch this year. 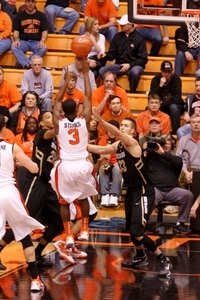 Depending on the play or foul situation of Cunningham and Starks, Nelson’s role and minutes have been undefined in his two seasons in Corvallis. Sometimes they’d need him to get the Beavers out of a shooting slump, or sometimes driving into the lane and either dishing off or putting up a floater would be the key. Whatever it was, Nelson was surely capable of both, but often times he couldn’t perform the necessary task on the night he was asked to do it. Sure, he’s had some big games – 21 points against Illinois-Chicago, 20 the next game against Howard. But only once in his career has he gone for 20+ against a Pac-12 opponent, and that was when he played all 40 minutes because Cunningham, Starks, Collier, Calvin Haynes, Lathen Wallace, Chris Brown, and Daniel Deane were all suspended for missing curfew. Starks is too streaky to be consistently counted on to win a game. The man they’ve turned to the last two years is gone. Without a doubt, the play of Nelson, especially in the final 10 minutes of games, will make or break the 2012-13 year for Oregon State. Angus Brandt, Senior, Forward/Center (9.1 PPG, 3.4 RPG. 1.1 APG. 0.4 SPG) – Brandt is one of the softer centers to come through Corvallis, but that’s not a bad thing. It’s actually a big plus for Oregon State’s offense. With the combination of Joe Burton, Collier, and Moreland filling up space down low, Brandt is able to hang out in the corner and torch opponents from beyond the arc. He usually gets two looks a game (which he’ll hit) before defenders realize they need to get out on this 6’10” shooting center that can stroke it. Some nice, but not necessary, improvements to his game would to be more assertive and aggressive on defense. You can’t coach speed, so we won’t worry about that, but if Brandt can do a better job of taking away chances inside, he could have a very special senior season. Joe Burton, Senior, Forward/Center (8.3 PPG, 5.9 RPG, 2.8 APG) – You didn’t really notice it until it was gone, but as Burton’s production went, so did the wins. More of a true forward/center, Burton would be good for a quiet 11 or 12 points a night. However, once February hit, the junior lost his touch around the hoop and defenders were able to key in on Collier down low. Burton averaged 3.3 PPG in the month of February (a stretch in which Oregon State went 1-5), including back-to-back scoreless nights at home against the Washington schools. Robinson’s confidence in the big man began to drop, as did the minutes, and Burton began to play tentatively once he did get on the court. All of the sudden, however, March came and Burton went back to the basics that made him a reliable scorer earlier in the year. Joe averaged 14 PPG in the Beavers final five contests before CBI competition started, making him the go-to guy in the post as the Beavers played their way into the semifinals of the Pac-12 Tournament. Despite his offensive struggles at times, Burton always remained a great passer. Not often do you see a big man tied atop the team assist averages, but his ability to throw sharp, tight bounce passes from the top of the arc made him a dangerous weapon even if he couldn’t score the ball. Eric Moreland, Sophomore, Forward (5.2 PPG, 6.8 RPG, 1.1 APG, 0.8 SPG, 1.9 BPG) – For the majority of the season, Moreland had zero touch around the hoop. And that’s okay because of his tremendous rebounding and shot-blocking ability. On a team that averaged just above zero defensive rebounds per game (I haven’t fact-checked that stat, but I can’t imagine it’s not true), Moreland was the lone bright spot. With his long arms and good springs, he had 11 games in which he recorded double-digit rebounds. As his playing time increases, he’ll have a chance to lead the conference in rebounds this season. This entry was posted on Thursday, August 23rd, 2012 at 12:12 pm by Connor Pelton	and is filed under microsites, pac 12. Tagged: Ahmad Starks, Angus Brandt, calvin haynes, chris brown, craig robinson, Devon Collier, eric moreland, howard, illinois-chicago, Jared Cunningham, Joe burton, lathen wallace, oregon state, roberto nelson, saint charles basketball club. You can follow any responses to this entry through the RSS 2.0 feed. You can leave a response, or trackback from your own site. Moreland was from Robinson’s 2010 class… And Collier averaged either 13.1 or 11.5… not both. Moreland was a transfer from UTEP, so I changed that to reflect the 2010 freshman class. Thanks for the catch on Collier.